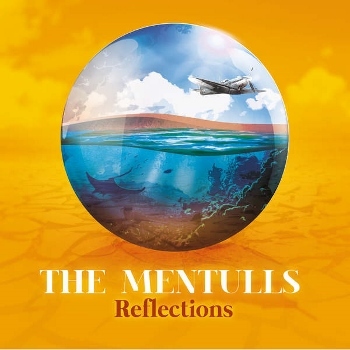 The UK blues trio, The Mentulls, team up with King King’s Wayne Proctor for their new album Reflections. The Mentulls hail from the North of England and comprise of Andrew Pipe (guitars/vocals), Jamie Pipe (keyboards), and Nick Colman on drums. An interesting combination having no bass player, but who needs one when you have Jamie Pipe, who is the perfect foil to the guitar virtuoso that is Andrew Pipe. Their genre is dubbed by many as “Progressive Blues Rock.” Without getting bogged down debating this, there are obvious progressive influences, the likes of Focus and Wishbone Ash. The progressive style of play fits the band to a tea with such a talented group of musicians. This is particularly apparent on instrumental tracks like “Reflections II” and “Time To Focus.” Special guest guitarist Aynsley Lister joins the band on the later. On tracks like album opener “Silver Bird,” “Home Tonight,” and the wah infused “I Can’t Slow Down,” you get top class British blues rock. It is of no surprise that The Mentulls chose “Reflections” as their title track; it is simply stunning. Andrew Pipe, who has an incredible appreciation of space, masterful control, and a great tone, plays with intricacy and passion. The final track on the album, “Speaking in Silence,” again is a standout track on the album. It is a progressive blues rock masterpiece with its subtle ebbs and flows, atmospheric keyboard intro, wonderful dual guitar harmonies, and roaring guitar riffs. It has to be said that the production on Reflections is superb. Wayne Proctor has really channeled and refined the band’s sound to deliver a great blues rock album. For being a trio, they have a huge sound. We look forward to hearing the band take the album out on the road later in the year.